Growing up under apartheid, my life was governed by two factors. On the one hand, as a family living in the heart of Xhosa-land in East London, it was impossible not to be struck again and again by the inhumanity and brutality of apartheid. So we devoted a lot of time and energy into combating apartheid through the Progressive Party and its successors. At the same time, my three brothers and I were caught up in that nefarious web called military conscription. It was either a case of go to the army or go to jail. There was no End Conscription Campaign to help us decide, so in the end we were forced to succumb. Both facets of my life have been comprehensively covered through drawings I did at the time on this blog, but I came across a miscellany of photos, photocopies and a special document which, in a way, encapsulates the era. I might have run this earlier, but it is a small claim to fame. This appeared on the front page of the Daily Dispatch around 1978. 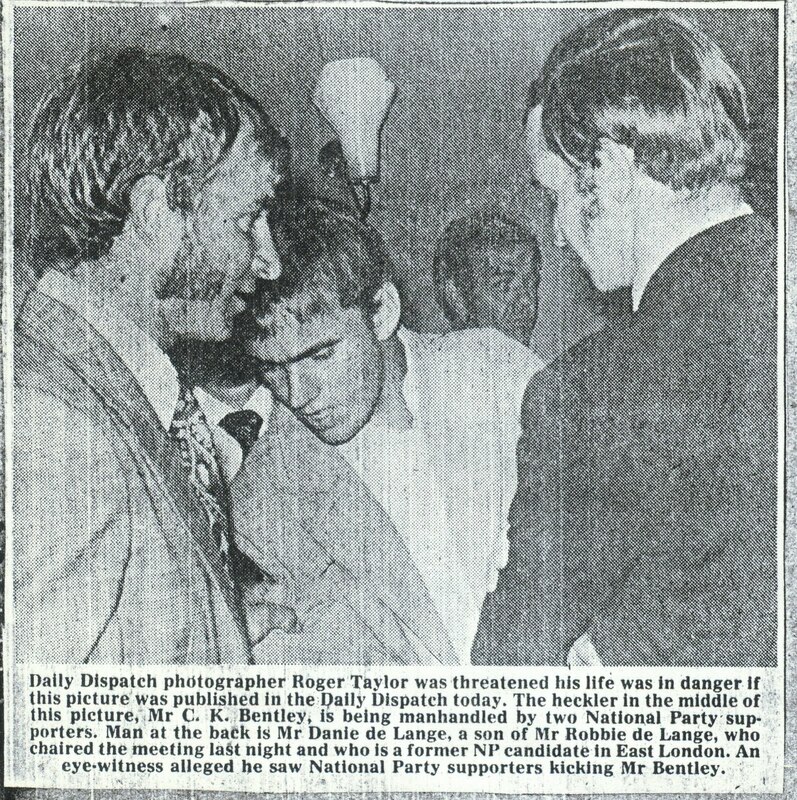 It was taken at a National Party election rally at a time when political tensions were very high. 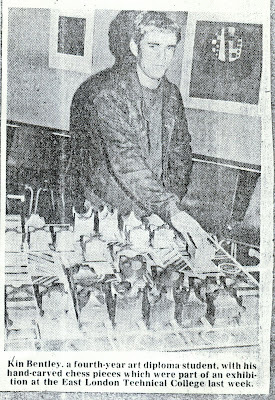 I was an art student avoiding the army and had worked for five months on the Dispatch straight out of school - under my childhood hero, editor Donald Woods. In 1977 Woods was banned as part of a massive clamp on newspapers and anti-apartheid organisations. This was about a year after the 1976 Soweto uprising. 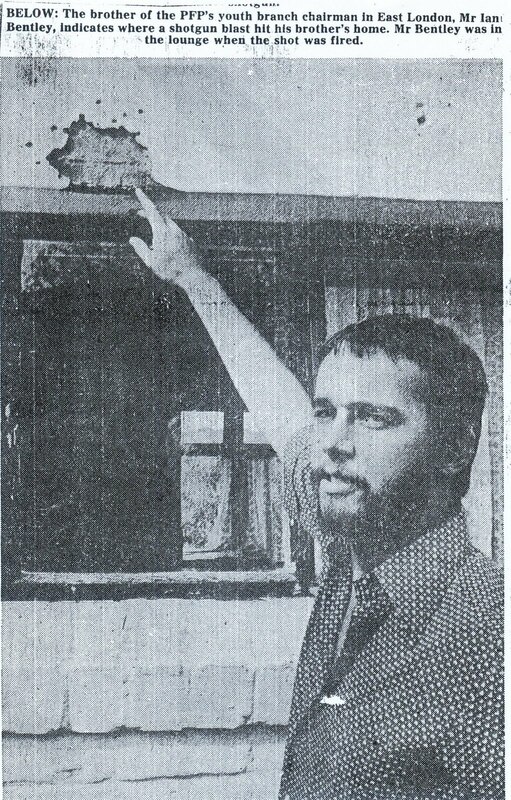 Also in the late-1970s, by brother Ian was alone at our family home in Bonza Bay when a shot was fired at the house with a shotgun. No one was hurt, but it was clear the security police had our number. We were active members of the PFP Youth, and I had been a regular writer of letters to the editor of the Dispatch attacking apartheid. Ironically, Ian had just recently returned from a stint as a conscript on "the Border". We didn't keep these clippings. Fortunately, an old family friend, Anne Marais, from up the road, had them in a scrapbook and she gave us photocopies. 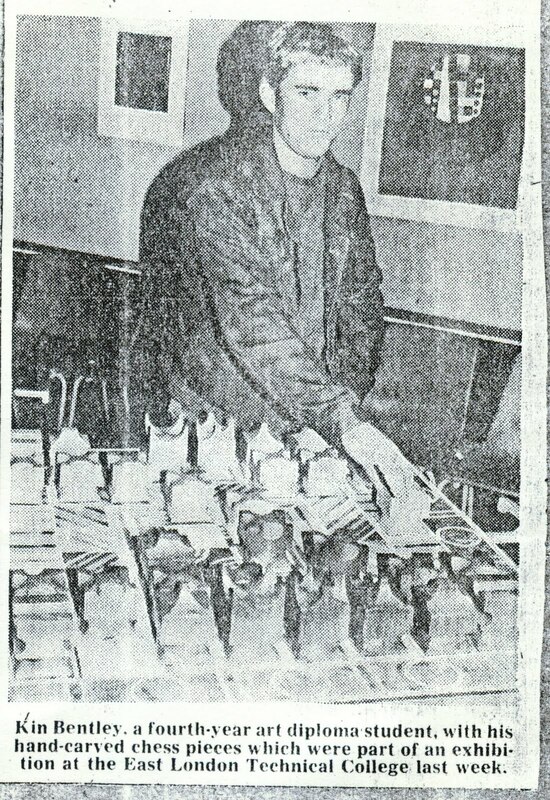 This was me during my final-year exhibition at the EL Technical College in 1978. Fast forward to November, 1987, and suddenly change is in the air. I was among the horde of journalists at the PE Holiday Inn when, under increasing international pressure, the National Party released Robben Island prisoner Govan Mbeki. I'm the dude on the left, taking notes. Mbeki's release really was the beginning of the end for apartheid. 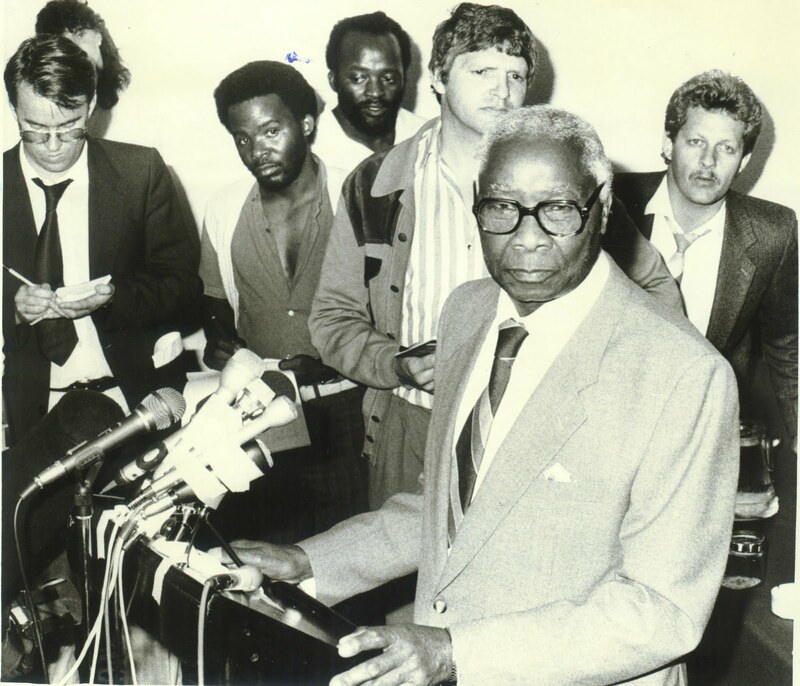 Directly behind Mbeki, on the left, is Bill Krige, another veteran PE journalist, while behind him is George Luse, one of the many freelance black journalists covering the dying days of apartheid. On a personal level, this for me was the nightmare envelope. No, I'm wrong. This was in fact just the opposite. Let me explain. When I received a slip informing me I had a registered letter, that was the nightmare. Then I had to sign for my call-up papers at the post office. 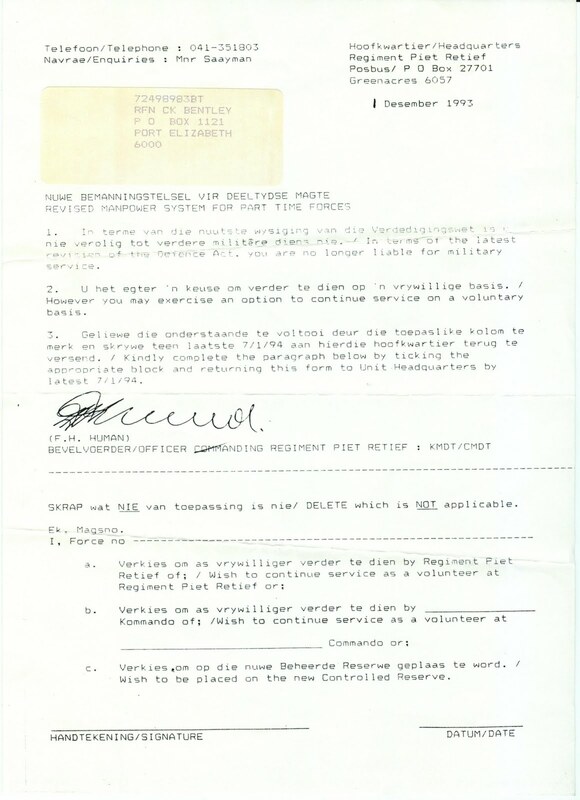 I was kept "entertained" by the SADF from July, 1979, till the early 1990s. And it was this ominous-looking baby which ended the nightmare. The back of the envelope reveals its source - my beloved PE regiment, where I had applied for "non-combatant service" after refusing to carry a rifle. 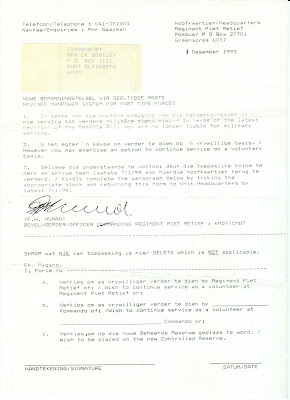 And inside, a notice informing me my days as a conscript were over.